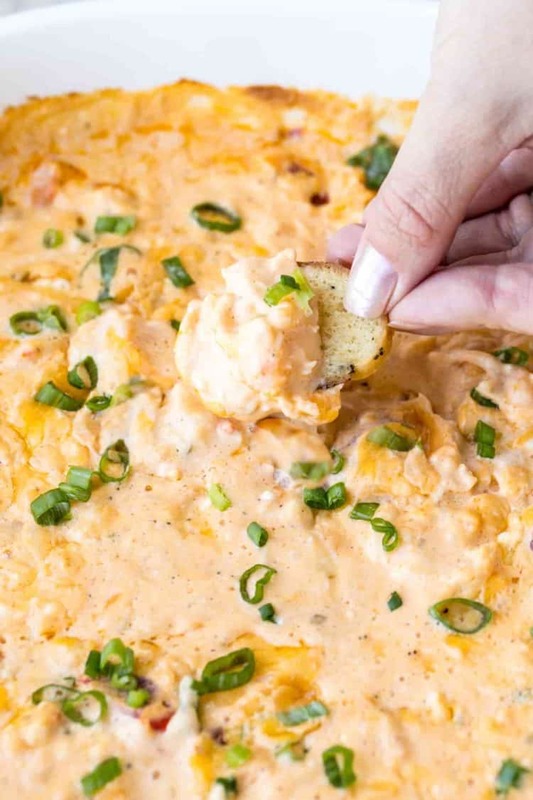 This Buffalo Shrimp Dip Recipe is everything a shrimp lover could ask for in a dip. Shrimp chunks in a cheesy and creamy buffalo mixture, baked and served hot. 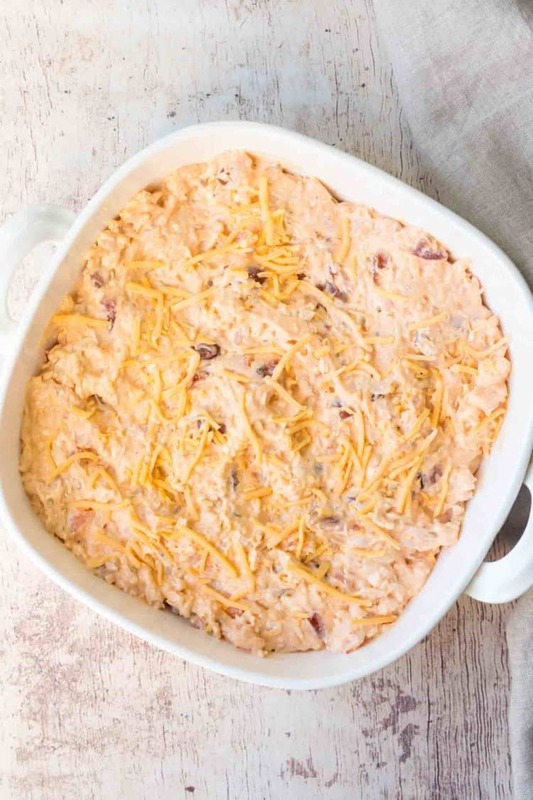 This shrimp dip is perfect for parties, potlucks or family get-togethers. 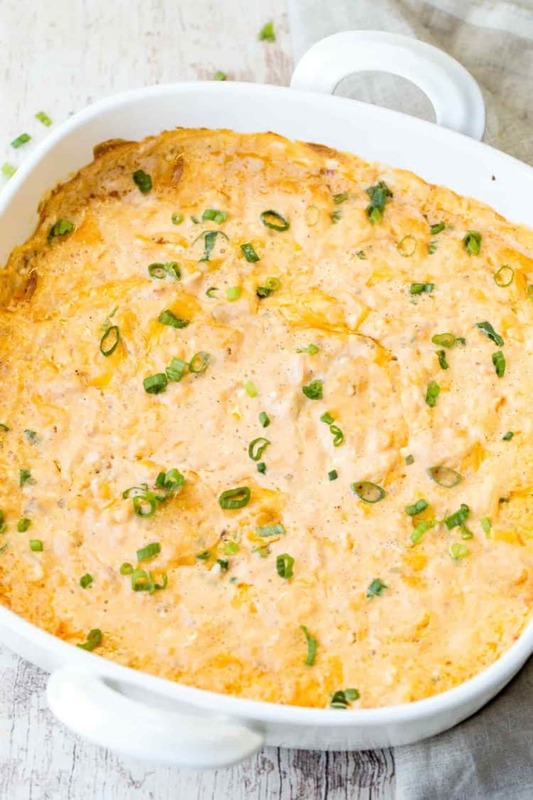 Though Buffalo Chicken Dip is extremely popular for parties, this Buffalo Shrimp Dip is going to give Chicken Dip a run for its money. 🙂 The dip was inspired by the popular Chicken Dip Recipe and it’s a hit every time I make it to a party or get together. You still have the kick from Frank’s Hot Sauce but it’s not overpowering. The added Blue cheese and yogurt balance the remaining flavors and bring out the shrimp in the dip. Can I add crab to the dip? If you want this dip more of a seafood dip instead of a shrimp dip, add crab meat! It will work perfectly in this recipe. Instead of 1 1/2 pounds shrimp, do 1 pound shrimp and 1/2 pound crab meat. Cook the raw shrimp. Once cooled, chop into small pieces. Beat the cream cheese, shredded cheese, yogurt, butter, hot sauce, ranch, bleu cheese. With a spatula, gently fold in the shrimp and tomatoes. Bake dip until it bubbles and cheese completely melts. Serve dip immediately with your favorite dipping sides. 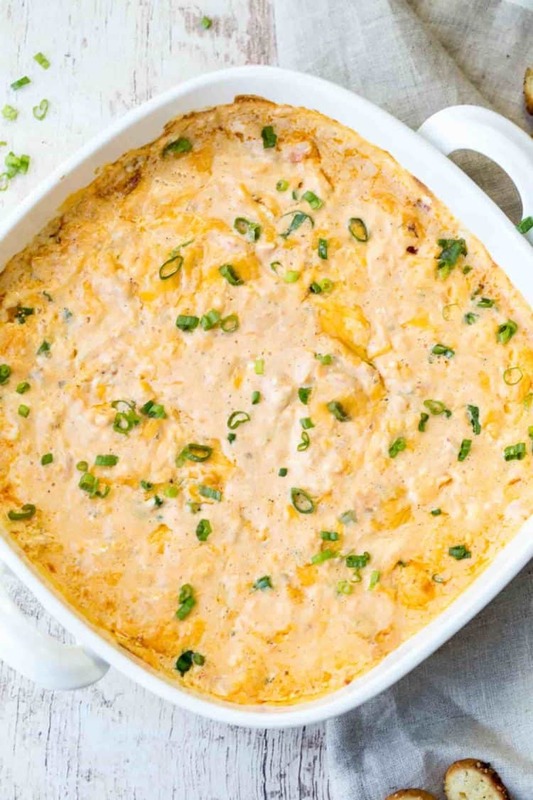 What to serve with Buffalo Shrimp Dip? 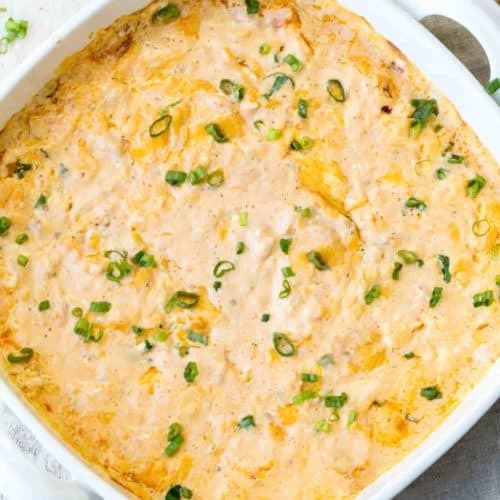 How to reheat Buffalo Shrimp Dip? To reheat the dip, cover the baking dish with foil and bake until reheated. I hope you love this Dip Recipe. Don’t forget to tag us if you make it, #ValentinasCorner. We love seeing your creations! Try these other great dip recipes: Salmon Dip Recipe and the Hot Crab Dip. Tools used to make this dip: Casserole dish, Skillet, Mixer. n a skillet, heat up 1 Tbsp butter and 1 tsp oil. Once hot add shrimp. Cook both sides until shrimp is pink. Remove from heat. In a bowl, beat together cream cheese and butter. Add yogurt, hot sauce, ranch, bleu cheese, shredded cheese, mix. Add the tomatoes and shrimp, fold with a spatula. Transfer into a casserole dish, cover with foil. Bake for 30 minutes at 355°F. *Cheese: Use your favorite mixed cheese, Colby Jack, Four Cheese, Mexican will all work. You can mix Mozzarella and Mild Cheddar also. Thanks, Rose! I agree, you’d never know there’s shrimp in it but the dip is still phenomenal. 🙂 Perfect appetizer for any party.